Opportunity is the most important thing in fantasy football, and outside of the quarterback position, no fantasy player touches the ball more than a team’s running back. So which running backs make the most of their opportunities? And, when looking at it in reverse, which teams give up the most fantasy points to opposing running backs on a per-opportunity basis? When it comes to receivers, the best wideouts are also the best from a points-per-route perspective. On the running back side, it doesn’t quite break down the same way, because of the different values of a carry and a reception. Here are the top 10 running backs (minimum 70 total touches) in terms of FP/T from 2017 (standard scoring). I used standard scoring because doing this for PPR leagues was far too heavily skewed toward third-down backs. Alvin Kamara topping the list is no surprise. 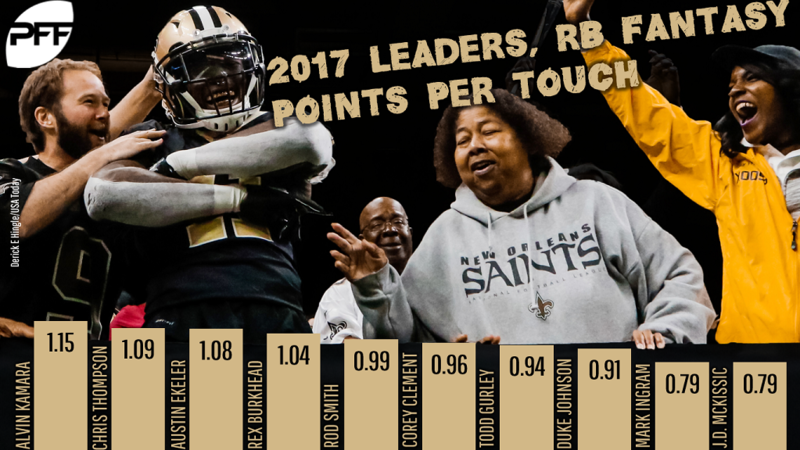 He set records last year, and it’s virtually impossible to identify a per-touch or per-opportunity or a per-anything stat from 2017 without Kamara coming out in first. Austin Ekeler — a sneaky option to have a successful 2018 campaign — ranked third, with 1.08 fantasy points per touch. He wasn’t too far behind Kamara and he was on pace with Chris Thompson, who was smashing in fantasy before sustaining an injury. Rex Burkhead played only 10 games due to injury, but he was electric whenever he had the opportunity to handle the ball. His 1.04 FP/T ranked fourth among all running backs last year, aided in large part by his eight touchdowns on 94 touches. Burkhead’s role in the offense should be unchanged in 2018; if anything, it could increase. Which teams gave up the most fantasy points per touch to RBs? You can expect to see this data on a regular basis throughout the 2018 season, which will be useful for DFS purposes, but here’s how it can be applied to season-long leagues as well. We took the above by-team data and determined which running backs would have the easiest schedule from a FP/T perspective next season. Titans running backs have the easiest 2018 schedule from a FP/T perspective, as their opponents gave up, on average, 0.63 FP/T. Lewis (0.78) ranked 13th in FP/T last season, while Henry (0.65) ranked 27th (out of 75 qualifying running backs). I find it interesting — albeit completely unrelated — that the Titans gave up the fewest FP/T last year to opposing backs. This tidbit will make Titans games important from a game script perspective in 2018. Opposing running backs could struggle against the Titans, while Tennessee backs could flourish. The Patriots have the second-softest schedule from a FP/T perspective. Burkhead (1.04), as noted above, ranked fourth among running backs in FP/T last season. Michel is a rookie, but he ranked third among qualifying college running backs (out of 239) in FP/T, with 1.42. White (0.79) ranked 12th in FP/T among running backs last year. In other words, all three Patriots running backs are elite from a FP/T perspective and they have an easy schedule in this arena. It’s not the easiest backfield to figure out, but it should be another fruitful season for New England’s backfield. The Panthers have the third-easiest schedule from a FP/T perspective next year. McCaffrey (0.75) ranked 15th in FP/T as a rookie. Anderson (0.53), meanwhile, ranked 56th out of 75. The stage is set for these Carolina backs to impress in fantasy in 2018. But things are a little muddied, especially when factoring in Cam Newton’s rushing ability and penchant for taking touchdowns from the team’s running backs. I actually wrote some about McCaffrey and Anderson in this piece about Cam Newton, highlighting the fact the Anderson was not an efficient scorer from inside the 5 last year. Below is the full list of players, sorted by their fantasy points per touch from 2017. Only running backs who had a minimum of 70 touches last year are included, and the fantasy points are based on standard scoring.